Currently in order to use ToPCAT to decimate a point cloud the input point cloud file needs to be in a space separated x y z file. 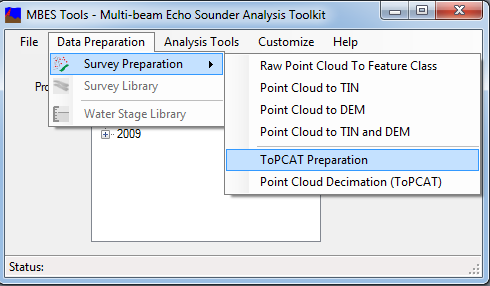 To address this need, ToPCAT prep takes in a raw point cloud file and replaces its separator with spaces so that the file can be used in ToPCAT. In addition to space separated files, files greater than 300 MB can occasionally fail to be processed by ToPCAT due to their large size. If you have a file larger than this or have run ToPCAT and it does not work you may want to consider subsetting your raw point cloud file with the Subset Raw Point Cloud Tool. formatted into columns of x, y, z.
the symbol used to separate the x, y, z values. 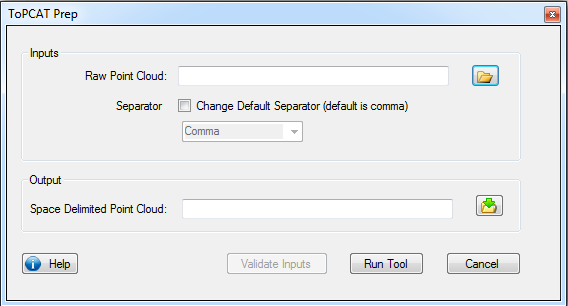 The default is comma. raw point cloud formatted into space delimited columns of x y z.